The story of the birth of Jesus found in Luke 2, is one of the most important stories told in the Bible. This story not only tells children about a very important historical fact, but it also introduces kids to Jesus Christ, the Savior of the world. The Bible teaches that Jesus is, in fact, the only true salvation. 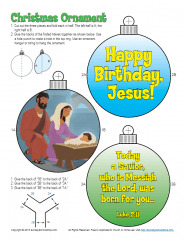 This fun, pre-colored Christmas activity about Mary and Joseph will help kids remember the importance of the Christmas story.